Life Cycle approach to Process Validation. The validation lifecycle is an approach to product and process validation from concept stage, through to end customer use, with a continuous feedback loop, that confirms continued adherence from the original design specifications through to end customer requirements. Many regulatory organizations now promote the life cycle approach to validation, for example guidance issued by organizations such as the US Food and Drug Administration, European Medicines Agency and Health Canada all promote the validation life cycle methodology. • Develops and demands a comprehensive understanding of the products and processes under validation. • Provides evidence of a state of control. • The approach is consistent with having a customer focus. • Assures consistent product supply that meets product quality standards. • A continuous process which changes and adapts to changing requirements. A validation lifecycle follows the following format. The functional requirements and system specifications are defined, then the installation and operational are performed. In some organizations a Pre-Validation study then follows, other organizations progress straight to a Performance Qualification. During the Installation and Operational Qualifications, calibration and maintenance programs will have been implemented, similarly formal change control will be in place and applied to the validation process itself. The output data from the Performance Qualification will be analyzed and may be deemed to be acceptable. Alternatively, where deviations to planned acceptance criteria are identified, there will be a need to investigate, address the reasons for the deviations and repeat the relevant sections of the validation, or to complete the full validation (depending on the risk associated with the deviation). The requirement for an on-going revalidation program will need to be determined up front. This will depend on the risk associated with the product or process under validation. This revalidation requirement will apply once the Performance Qualification is successfully completed and signed-off. The “revalidation” becomes a feedback loop under the lifecycle approach, which will act as a check of continued compliance to design specifications, based on a time based re-validation program, or alternatively whenever change is implemented to the original validated product or process. The focus for an organization needs to be that validation is never complete, validation needs to be seen as an on-going activity, with continual checking to confirm compliance with the original design expectations. As with all validations, preparation is essential. 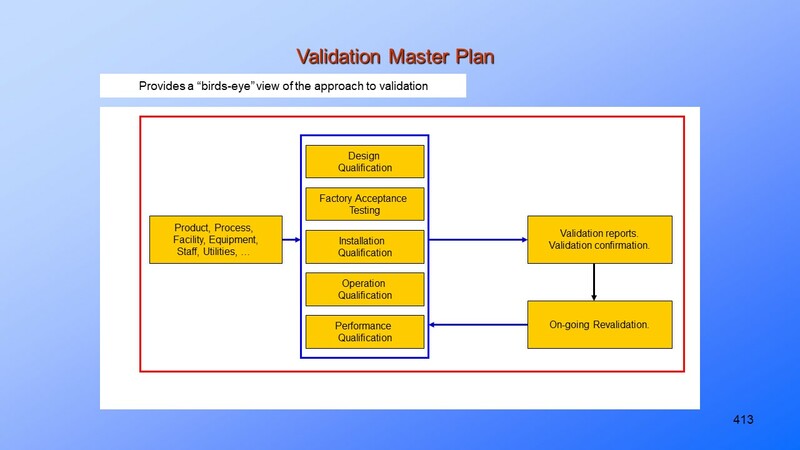 The preparation stage in a validation lifecycle approach is similar to any other validation, i.e. the technical personnel involved will need to have a comprehensive understanding of the process or product to be validated, the critical performance and quality attributes will be defined, sources of variation will be known and can be controlled to within acceptable limits. A risk assessment will be in place and will drive the areas of focus for the validation study. During the Qualification phases, all facilities, process equipment, utilities will be qualified. Analytical methods will be validated. Operating and inspection procedures will be in place. As part of the validation lifecycle, there will be on-going maintenance of the validation. Information will be continually gathered and reviewed, controls will be maintained, all proposed change will need to go through formal change control which may instigate a revalidation effort. Relevant results from the process will be identified and continually demonstrate compliance with the approved validation.